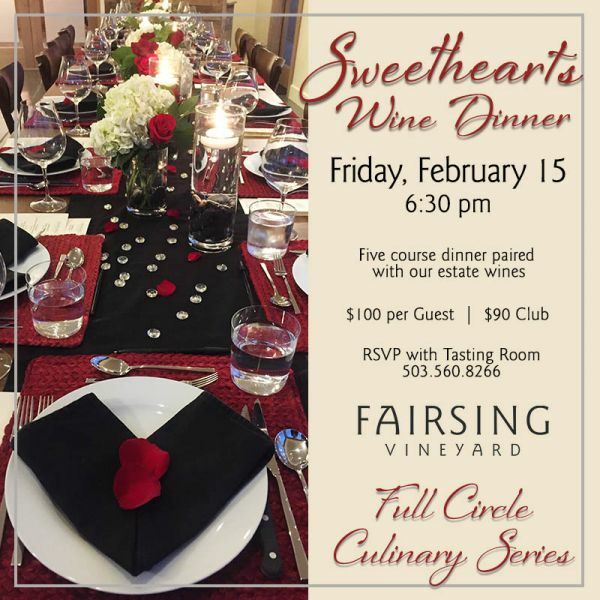 Join Fairsing Vineyard for a Sweethearts Wine Dinner Friday, February 15 beginning at 6:30 pm. Enjoy a thoughtfully prepared menu crafted by Chef Rebecca Clarke showcasing a rare vertical of our Pinot noir Dardis from the ’13, ’14, ’15 and ’16 vintages. For your sweet tooth, tentative dessert plans include red velvet cake. As part of our Full Circle Culinary Series, seating for this dinner is limited. RSVP with our Tasting Room 503.560.8266. $100 Guest per Guest / Wine Club members $90. Oregon Wine Press is a monthly consumer publication dedicated to Oregon wine, pinot noir, food, vineyards, winemakers, and insider-industry happenings. Established in 1984, OWP was acquired and re-imagined in 2006 by the News-Register Publishing Co., which is located in the heart of wine country, McMinnville, Oregon. Oregon Wine Press and OregonWinePress.com are owned and operated by News-Register Publishing Co., P.O. Box 727, McMinnville, OR 97128. Oregon Wine Press has been serving the Oregon wine industry since 1984.